To celebrate the launch of Haggs Bank Bunkhouse and Campsite we will be hosting an activity meet (no presentations!) with loads of opportunities to get out and explore the North Pennines – England’s Last Wilderness. Accommodation available on-site will be the bunkhouse and camping areas. Numbers are limited to 23 in the bunkhouse and 100 for camping. TO BOOK YOUR PLACE CONTACT US TODAY! Please note for this event you CAN’T use our online booking system! £40pp in the bunkhouse, including all bedding (not towels!). The bunkhouse has 2 bunkrooms sleeping 9 and 14 both mixed in triple bunks. The bunkhouse also has a fully equipped self-catering kitchen, lounge and dining room. The campsite is split into different areas. Some pitches are close to car parking in the woodland area and others are up in our wildflower meadow, but all are within easy access of the toilets and shower room. For those booked into the bunkhouse for the weekend there is also the option of stopping the Thursday or Sunday night for an extra £10pppn. Alternatively if you’re one of the campers you can stop the Thursday and/or the Sunday night for an extra £5pppn. Friday night will be time to chill out round the bonfire, ready for an activity packed Saturday. 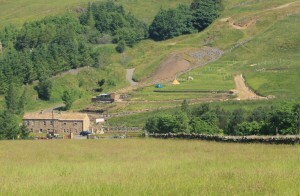 – A local fully qualified activity instructor will be running a couple of trips to take small groups (5-10 people) down the local disused lead mine. There will be a 3 hour trip into Smallcleugh Mine for £15pp or if you just fancy a taster he will also be running a 1 hour trip for £10pp. Safety helmets and lamps are provided but there’s a good chance you’ll get wet so you will need suitable footwear (wellies are ideal) and your scruffs! – Road tours to enjoy the local scenery! – Group walks exploring 2 local beauty spots one natural, a pretty waterfall you can walk behind Ashgill Force and one manmade, Epiacum, described as the best preserved fort in the Roman Empire! – Cycle hire easily organised through North Pennine Cycles in nearby Nenthead and maps available of local cycle routes. Unfortunately we aren’t able to offer food on-site, but we have arranged that the local pub, The Miners Arms in Nenthead, will be offering food. Saturday night we’ll be having live music onsite from Sleeping Dogs, a great local rock band, a bonfire again and just the usual party atmosphere! Sunday morning we‘ll all have the chance to watch part of the Beamish Trophy Trial which runs up the side of the site. And remember if you’re coming from the South you’ll have to travel up the famous Hartside Pass to get to us!